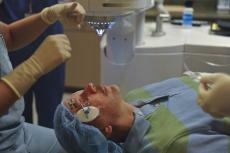 A brand new robotic surgical assistant from the Netherlands is being used in the U.K. for eye surgery. This robot, known as the Preceyes surgical system (PSS) is now in trial runs at the prestigious University of Oxford. The PSS is considered a "tele-operation robot," which simply means each robot has arms with special mechanical manipulators that can expertly pick up and use various surgical tools. Surgeons are always on hand controlling the PSS with a specialized joystick. As most people could imagine, eye surgery is extremely intricate. The demands placed on the surgeon are immense, and a steady hand is a must for anyone in this profession. Dutch researchers hope their PSS will remove most of the human error from common and complex eye operations in the years to come. The current study of the PSS's effectiveness is currently being held at the John Radcliffe Hospital in Oxford. Researchers from Oxford's Nuffield Laboratory of Ophthalmology are using the PSS for a total of 12 eye operations. As of today, six of the surgeries have been completed, which officially concludes "phase one" of this trial. The entire study will be finished by mid-2017. Oxford researchers are particularly looking into the Robotic Retinal Dissection Device's efficacy within the PSS software. In reference to the classic sci-fi movie Star Wars, the designers at Preceyes humorously dubbed this device "R2-D2." The first surgery using PSS at Oxford took place in September of 2016. Surgeons were tasked with removing a membrane on a 70-year-old's retina that was only 100 micrometers thick. Doctors used the PSS software to make a 1mm incision into the patient's eye and used various surgical tools to pull the membrane out of the patient's retina. Most of the other surgeries using the PSS since that date have been similar in nature. Professor Robert MacLaren, a head eye surgeon at John Radcliffe, said most of these surgeries involved repairing macular holes in the eyes. All the surgeons who have used PSS in this first phase of treatments say it greatly reduces their stress during surgical procedures. No longer do these eye surgeons have to worry about hand tremors interfering with their surgeries. MacLaren said the only way he could explain using the PSS in layman's terms is to imagine driving your car using a smartphone. Although it feels weird at first, MacLaren said the car ride tends to go along smoother after you get used to it. The same idea applies to using a joystick control instead of your own bare hands on eye surgeries. Workers at Preceyes have been developing the PSS for over ten years now. In 2014, Preceyes won an award for their innovation at an ophthalmology conference, and it was here that Dr. MacLaren approached the company. MacLaren was interested in using Preceyes' technology to help with his own gene therapy work. Ever since that date, Preceyes formed strong bonds with both the University of Oxford and the gene therapy company Nightstar. The first phase of the Oxford study was concerned with the safety of using PSS in regular surgical procedures. As surgeons move into phase two, MacLaren wants to explore the possibilities for using surgical robots for both drug and gene therapy treatments. The next six procedures will involve using the PSS to inject therapeutic drugs underneath a patient's retina. Preceyes has its head office in the municipality of Eindhoven in the Netherlands.